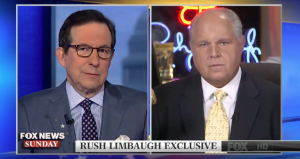 RUSH: I’m gonna tell you what’s gonna happen today, folks. We are gonna pick up on the theme that I established yesterday about how the law in this country — I guess it’s been this way to a certain extent. Nothing is new. I’m not trying to be outraged here over something I think’s unprecedented, but in certain aspects, this is. The law is being applied differently to the most powerful among us, and they are being allowed to skate. And I want to continue that theme as it relates to the so-called investigation of Trump, which is really nothing more than an effort to drive down his public approval numbers to be able to force him out. There are further, not developments, but there are things that I want to add to it today that are extremely powerful. In addition to that, we got James Comey on CNN last night. You know, this guy’s being treated like he’s a candidate for something. This is unprecedented. A guy writes a book and gets town halls, gets a month worth of interviews, people are being charged to sit at his book signings. So there’s obviously something more here than just the sale of books, which of course is one of the primary things for Comey. The BookScan sales report first week, 600,000 copies. If Comey keeps going at this rate he might reach the two million figure that both of my first hardcovers sold back in 1992 and 1993, and that would be two million, actually two-and-a-half million on the second one. So total of five million, almost six million hard copies, nine million total paperbacks. So Comey’s got a ways to go here. He may have to write a second book to get to that level, but they’re sure trying to help him. Now, of the 600,000 that are sold, how many of them do you think have actually been read? Well, there’s no way of knowing, but I think that some of these purchases of Comey’s book are nothing more than expressions of loyalty by deranged, mired in hate and disgust leftists. So the purchase of Comey’s book, and then letting everybody know that you purchased Comey’s book, is the statement. You don’t have to read it. And it’s just an interesting side light as to how many are. I’m not trying to put it down. I’m just offering an observation about it as I always do. RUSH: I want to start here on the continuation, the update of the themes that consisted of yesterday’s program with James Comey’s appearance at a town hall meeting. 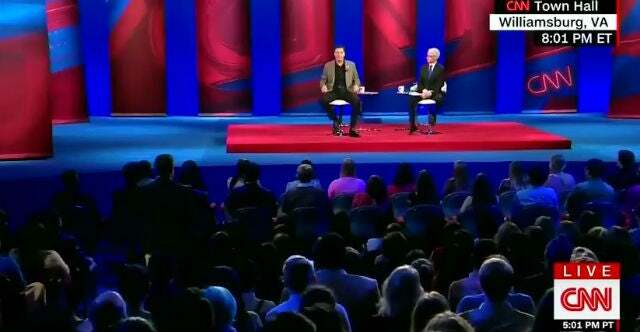 Here’s an author with a town hall meeting. It’s not really talking about his book. It’s a town meeting to talk about what James Comey thinks, period, as though he is an oracle. James Comey is on a nationwide tour being presented as the one man in Washington that has all the answers. 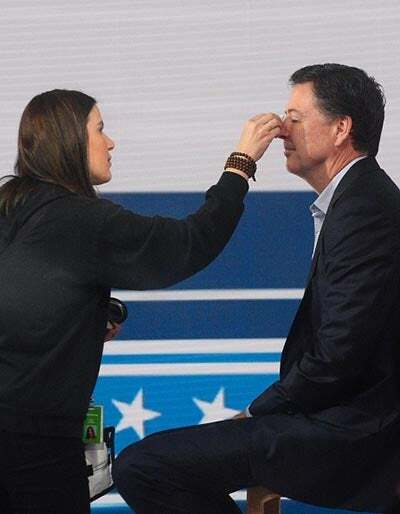 In fact, he may now, in terms of image-making… James Comey may have risen above Robert Mueller in terms of the image of integrity, honor, and all of this. This is the attempt that is being made. And yet, as you will hear, James Comey is one of the people who should be indicted — James Comey — on multiple counts, including lying. And while that remains true, he is being made into an unimpeachable, infallible hero of the deep state, which he denies exists. I want to start this with being asked about the deep state by Chris Wallace in February of 2017 on Fox News Sunday. WALLACE: You also use a phrase — which I have to say that I only heard for the first time in the last couple of weeks — the deep state. And that’s the notion that there’s an Obama shadow government embedded in the bureaucracy that is working against this new president. I think some folks are gonna think that’s right on and some folks will think it’s awfully conspiratorial. RUSH ARCHIVE: Well, I would love to claim credit for that, but actually, I think a reporter by the name of Glenn Greenwald at The Intercept — who has got a relationship with what’s-his-name, Assange — I think he actually coined the term, and I think it works. COMEY: Because I know no president serves long enough to destroy the culture that is at the root of them. I hear this term “deep state” all the time, and, uh, there’s no deep state. But there is a deep culture and a commitment to the rule of law, equal protection of the laws, the fundamental values that are at the core of our Constitution that runs really deep. RUSH: Now, wait a minute. What’s the difference? “Deep state,” “deep culture”? So he admits there’s a deep state. He admits there’s a deep culture, and that the deep culture is committed to the rule of law. It is not committed to the rule of law! It is committed that the rule of law not apply to Donald Trump. It is committed to an absolutely new premise, and that is you are guilty until proven innocent. That is how the justice system is dealing with Donald Trump. The way it’s written, we’re all innocent until proven guilty. You have to be proven to have done something beyond a reasonable doubt in a criminal proceeding. Civil it’s a little different. The preponderance of evidence is all you need. But a criminal proceeding, they have to show — the accusers have to prove beyond a reasonable doubt to a jury — that you did it. Not so with Trump. This entire investigation Donald Trump has been guilty, and it’s up to him to prove his innocence. Guilty until proven innocent? Sorry, folks. It doesn’t work this way. It cannot working work this way. But that’s what Donald Trump has to deal with. Donald Trump and everybody on his team that’s come under the investigative jackboot of Robert Mueller and the rest of these people in the deep culture, are guilty until proven innocent. And as you know, you cannot prove you didn’t do anything. And the way this manifests itself… This is really hideous. Let’s take a look at dossier. There is no evidence! There is literally no evidence of any allegation in the dossier. And yet how do the proponents of the dossier deal with that? They are saying, “Well, you can’t prove it didn’t happen.” Uh, sorry. That’s not the American system of justice. An accused does not have to prove he didn’t do it. Now, that may be a legal strategy given certain aspects of a trial and a crime. In other words, the jury may be so convinced that the perp is gonna be guilty, the perp may have to find a way to prove somebody else did it. But as a governing principle, guilty until proven innocent? We will not have a United States of America as we know it if this becomes the standard operating procedure — guilty until proven innocent — and yet every proponent of the dossier, when you tell them that there is no evidence for it, they are quick to reply by saying, “Well, you can’t prove it didn’t happen.” That should not ever be a standard. If that’s the case, then you’re gonna be able to convict anybody of anything you want at any time if you control the justice system. If everybody is presumed guilty — and in many ways (in tax court, for example) that is the starting point. But in genuine criminal matters, it cannot be. And yet that is where Donald Trump is. And that’s two systems of justice, folks. There’s one for Trump, and there’s one for everybody else. And so St. Comey here’s saying “equal protection of the law.” Sorry. Mr. Trump is not being granted that. And some are being overly protected by the law by not even being pursued. COOPER: You said there’s no “deep state” but you talk about a “deep culture.” It doesn’t sound that much different. I mean, a “deep culture” — which has ways of doing things and believes it is the right way of doing things — isn’t that some of what President Trump was elected to shake up? COMEY: Absolutely not! I’m talking about a culture of commitment to the rule of law and to the values enshrined in our Constitution. No one, I hope, voted for him with the idea that he would destroy those values. COOPER: So when some say the “deep state” is trying to destroy President Trump, you’re saying point-blank that’s not true? RUSH: BS. I just call total BS. “I’m talking about a culture of commitment to the rule of law.” There is no commitment to the rule of law in this investigation. That is the point. The rule of law has been thrown out by people who have the power to throw it out. And these are the people in the deep culture, the deep state who run the DOJ and who run intelligence services. By the way, when you talk about criminal behavior, when you talk about the standards of justice, innocent ’til proven guilty, preponderance of the evidence on a civil case, you wonder why intelligence is never used in legal proceedings? ‘Cause nobody ever has to prove it! Intelligence, by design, sometimes can’t be proven. That’s why there are analysts all over the CIA, the DIA, the NSA. Raw intelligence comes in from all over the world, agents around the world produce it. It has to be pored over with a fine-tooth comb. You can never prove it for certain. You have to trust it or distrust it. You throw a lot of things into the mix: bias, competence, there’s all kinds. But intelligence is never used in criminal proceedings because it cannot be ever verified. If it were verified, you would expose the spy that did it. You just don’t do it. And yet Trump is also being subjected to that, because this is a counterintelligence investigation that they are turning into a criminal investigation, and they’re using bogus spy data collected by Christopher Steele, they’re trying to portray this as legitimate intelligence, and now they’re turning this into a criminal matter! The justice system is being turned upside down every day in this country in order to get Trump. And at the same time it’s being left alone so as not to injure the people who are gunning for Trump and anybody else in his orb that they can get. Because what’s happening to Kanye West is a little microcosm of what’s trying to be perpetrated against Trump, and that is not only get him, but send a message to anybody who might want to follow in his footsteps: Don’t even think about it. Well, the rule of law has been punted here. The rule of law — innocent until proven guilty — that’s not applying here. Trump is guilty. He’s guilty. 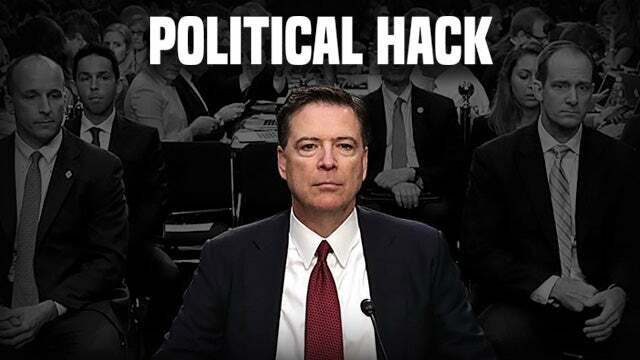 He was guilty the moment he won the election. Trump is guilty of whatever allegation they want to make, and it’s up to Trump to prove he didn’t do it. They don’t have to find evidence that Trump did it. In fact, they can make up evidence that Trump did it! They can create lying, filthy, fake evidence that says Trump did it — and they can get a warrant to spy on Trump with the lying, stinking, fake evidence. And then they can destroy Trump and try to destroy anybody in his orb in the process because everybody is guilty until proven innocent. How in the world Comey can say that what’s happening now is right out of our jurisprudence and its history is an abomination. So let’s resume. We now resume the audio sound bites of Comey’s town hall appearance on CNN last night. And the deck was stacked two to one — audience members two on one — in favor of Comey. Two out of three were in favor of Comey, in other words. And they had to have some stragglers in there. One of the questions that they allowed to be part of the program was from a student at William & Mary. I don’t know if it’s William & Mary College or William & Mary University. It’s one of the two. Her name is Julia Wicks, and she wanted to know… (chuckles) We talked about this yesterday. Do you remember what I said to you yesterday? I said, “Get ready, folks! Somebody is gonna produce a tape of prostitutes peeing on a bed. It’s gonna look like security camera footage from a hotel room. “It may be in black and white, and we’re gonna be told, ‘This may well be it! This may well be it! This may well be Trump hiring the prostitutes to pee on the bed. That right there! That may be the one that Obama and Michelle slept in that the prostitutes are peeing on!” Well, what’s to stop them from doing that? They haven’t stopped faking and making up allegations. What do you think the Steele dossier is? It is fake, made-up allegations! It isn’t evidence. It’s fake, made-up allegations — and it is the center of all of this. If that thing had been exposed for what it is on day one, this investigation would have been shut down. If James Comey had told Trump that what he was showing him was opposition research from the Hillary campaign, this investigation would have ended. Ninety-five percent of what this investigation consists of is fake, lying, made-up BS that has been portrayed as intelligence and therefore evidence. They’re telling us they can’t corroborate it. They’re telling us they haven’t been able to identify it. But they say it’s up to Trump to prove it didn’t happen. So you see, Trump is guilty until proven innocent. And Comey talks about the rule of law? So, anyway, this student from William & Mary has a question for Comey. STUDENT: What do you think would happen if there were so-called pee tapes and they were leaked to the public tomorrow? Would it matter in the long run? COMEY: That’s a question that you’re as qualified to answer as I. Uh, I suppose it might matter in the long run to the extent it casts, uh, embarrassment and shame upon the leader of our country. But you’ll be able to judge that better than I. RUSH: Wait just a… What the hell kind of answer is that? The peeing on the bed is once again 75% of this investigation. It’s that puerile stuff that has got people intrigued. That’s the titillating garbage in this investigation that makes people wonder if it’s true, and Comey is asked, “What happens if a pee tape was leaked to the public?” and Comey says, “Uh, well, I suppose it might matter in the long run to the extent it casts, uh, embarrassment and shame upon the…”? If a pee tape leaks and if somebody tries to tell us it’s legit then the investigation will have been deemed to be successful and it will be used to get rid of Trump! It will be used to verify the dossier. Why doesn’t Comey say that? Why doesn’t Comey say, “Well, if there’s a pee tape and if it leaks, that pretty much wraps up the investigation; that will verify the dossier”? Yet Comey is so wrapped up in his own Clark Kent/Superman image that he says, “Well, you’ll have to be the judge of that. The real answer to this question is, “Sorry, Miss William & Mary student, but we haven’t been able to find one. Sorry, we’ve been looking for almost a year and a half for evidence of a pee tape, and we don’t have any. We haven’t been able to find the pee tape. I don’t know. We haven’t been able to verify the dossier.” That’s the answer, or the other answer is, “Well, if a pee tape ends up leaking and if it’s a real one, he’s done.” Either of those two is the answer, and Comey knows it. But, see, Comey doesn’t want to appear to be gunning for Trump for political reasons. Comey wants to be seen as Clark Kent/Superman, Mr. Paragon of Virtue, who is shamed and outraged and offended by this reprobate that’s occupying the White House now. (impression) “It is so demeaning. He’s in such poor taste. We’ve got to get rid of this blotch on our beloved White House and our beloved presidency.” His answer to that question gives up everything to me, the fact that he will not answer that question truthfully. Because that’s easy. Again, the two answers are: “There isn’t a pee tape. Anderson Cooper, journalist, follows up with the information that Trump is rumored to have spent the night in Moscow. COOPER: You also said in your memos that the president told you twice that he did not spend the night in Moscow around the Miss Universe pageant. Since then, flight records, social media posts, congressional testimony, also photographs, prove that he actually did spend the night in Moscow. What’s the — do you think it’s significant that the president lied to you twice about that? COMEY: It’s always significant when someone lies to you. RUSH: Well, is that true? Because, Mr. Comey, many people think you’ve been lying through your teeth in testimony and in televised press conferences. Now, let me ask, has it been proven that the president spent the night in Moscow? Have you seen it? The president said he spent the night in a hotel room. Well, see, spent the night. You realize the time difference here. You realize Moscow’s eight hours ahead here. Travel records, when did he leave, when did he get back, how many hours does the travel take both ways and how many hours does he spend each night in a hotel room does it all work out time-wise? We’ll have to see. At any rate, we remain where we have always been, no evidence for any of these allegations.